A fascinating glimpse into life at home in the country with Paul and his animals. 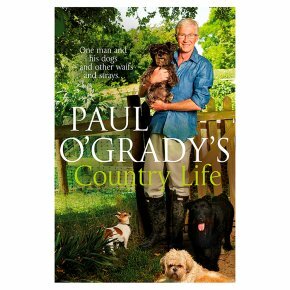 Paul O'Grady's Country Life takes us into the home of one of Britain's best loved stars. Paul's life in rural Kent -- which he shares with his dogs, sheep, cows, chickens and owls -- is as far removed from the bright lights of celebrity as you could possibly imagine. Yet this is where he is happiest and most relaxed. In tune with the rhythms of the country year -- from lambing in the spring and the village fete in the summer to the Halloween parties of autumn and the crackling fireside festivity of winter -- Paul's life at home comprises all the joys of rural existence. Whether he's baking a Simnel Cake for Easter or making a special meal when his grandkids come to stay, cooking up his herbal remedies like Four Thieves Vinegar to ward off winter colds or making his own Christmas decorations to decorate his lovely house for the festive season, Paul is never happier than when he spends time at home with his animals. Beautifully designed and illustrated with specially commissioned photography throughout, this book offers a very personal insight into the life of a national treasure.